Using a health-focused smartphone app may not be enough to help many overweight people who want to lose weight do so, but it may work for some, according to a new study. 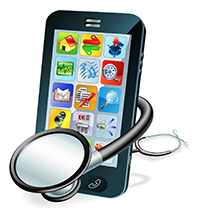 Published in Annals of Internal Medicine, this is one of the few randomized controlled studies on the effectiveness of health phone apps, a booming industry. The six month study included 212 participants, all overweight or obese. After expressing interest in losing weight to their physicians, about half of the patients were randomly assigned to a standard care group or the health-phone app group. Based on earlier focus groups, study researchers had selected a specific app. Research assistants helped the health-app group download and use the app, answering questions for a week after enrollment. The standard care group was asked to choose any activities they wanted to lose weight. After six months, there was no difference in weight loss between the two groups, with neither group losing more than about half a pound. Using self-reports, there was no difference between diet and exercise between the start and end of the study. Even though at three and six months, the health-app group reported they were meeting their personal calorie goals more than the comparison groups. Logins showed that participants assigned the health app sharply decreased using the app after the first month. On average, people logged in to the app eight times in the first month and then none to two times during the sixth month. A handful of participants used the app at least 30 times that last month but usage overall had dropped to only 34 people using it at all by then. Without prompting, 14 of those in the control group also downloaded and used the same app. It was a participant in the comparison group who used the app the most (782 logins) and who lost the most weight (29 pounds). Among participants in the health app group who lost more than 10 pounds — six of them — they did use and find the app useful, citing how it helped them understand their daily calorie counts and portion sizes and it spurred them to cut back on sweets and alcohol. Although the app did not appear effective in general, conclude the authors, it may be helpful as a weight loss tool for someone who is ready to self-monitor calories. The primary funding source of the study: Robert Wood Johnson Foundation Clinical Scholars Program, National Institutes of Health/National Center for Advancing Translational Sciences for the UCLA Clinical and Translational Science Institute, and the Resource Centers for Minority Aging Research Center for Health Improvement of Minority Elderly under the National Institutes of Health/National Institute on Aging. Brian Yoshio Laing et al. “Effectiveness of a Smartphone Application for Weight Loss Compared With Usual Care in Overweight Primary Care Patients: A Randomized, Controlled Trial.” Ann Intern Med. 2014;161(10_Supplement): Vol 161. No. 10._Supplement.